Photo courtesy of John Wilson. No climby lest you fall downy. And np polishing the knob either..
Is this another invention of Takahito Tanakas? that’s the reason why China fails miserably in street hockey. It makes the authorities a bit toey. 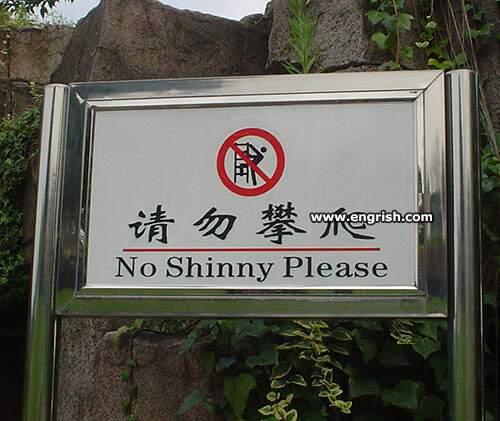 So you wouldn’t like a shinny peny? Shinny is what happens when you are stupid, or inconsiderate enough, to make love to your kerido’s pequeño y hermoso culito, without any lubricant. @DNT a couple a days ago. I am pleased you took my allegory “in one foul swipe ” as a play on the words “in one fell swoop”. Not many nowadays, are good at plays on words. I would say; Because they, only nominally, speak English. But I would guess, that by now, you realise that almost everything I post, is usually a play on words; From Spoonerisms to anagrams. I still like Takahito Tanakas ie Take a hit to the nackas.’ I think, if I had the misfortune to be introduced, in respone to; “O name wa?” to Takahito Tanaka san, I would fall on the floor laughing. I would leave the interpretation, to some unfortunate being like Pete. I do think the easiest way would be to tell him,was that I was dropped on my head as a little baby, and often do things like that. @Marum | 10:11 pm: My internet has been down for the last 8 days (Incompetence at both the NBN and my ISP, from what I can see). I’ve been missing the fun around here – of which I can see there’s been plenty! BTW, Spoonerisms I get, but anagrams are harder. I’m a lover of crossword puzzles, as long as the setter isn’t a Yank. They can be so parochial! – Shinny dip, anyone ?